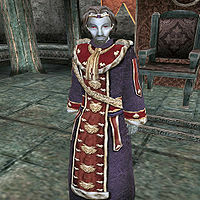 King Hlaalu Helseth, a Dunmer, can be found in the Royal Palace. He has recently become the king of Morrowind, after the death of King Llethan. Although King Llethan was old, there are rumors that Helseth killed him with poison, but there doesn't appear to be much evidence of these reports. These rumors are well documented in the Common Tongue, a paper printed by Trels Varis that can be found in a variety of locations throughout Mournhold. After a little investigating, it becomes apparent that King Helseth was behind the Dark Brotherhood attempts at assassinating you. While the King says it was a simple mistake, his history of assassinations and events during an assassination attempt on Barenziah, Helseth's mother, seem to indicate that he wants you dead. Of course, even though Helseth is obviously suspicious of you, he is facing a greater problem in controlling Almalexia and the Tribunal Temple's influence. He is carrying the Royal Signet Ring, a valuable and extremely useful ring, a Daedric Dai-katana and a unique Frostguard Robe, under which he wears Royal Guard Cuirass, Greaves and Boots. [Disposition ≥ 40.] "We are pleased to see you, sera." "You would dare approach us without being granted an audience? Guards!" "Ah...so you're the one Tienius has been telling us about. Interesting. You'll have to forgive us for the slight inconvenience earlier. It appears we were given a bit of misinformation. The Queen Mother has spoken of you as well." "Ahhh...%PCName. Have you learned more about that plot?" "You're job is to protect Barenziah. See to it." "I understand you were able to protect Barenziah." "Have you come to be of service to your King?" "It is not yet time to fight my champion. Return later, and we will have the battle." "Have you come to fight my champion? Are you prepared to face Karrod?" "Enough! I have seen you fight my champion, though I find it hard to imagine how you have succeeded. I did not believe anyone could best Karrod, but you have shown me otherwise. And he speaks! There are depths to you, %PCName, that I will fathom in time. For now, you have proven yourself to me." "You have questions about my plans for you?" "Yes, %PCName? I thought you were sent to learn more about the attacks. I also told you to stay away from the Royal Palace until you had learned all there is to know! Do not take this job lightly." "I have been hearing many stories about you, %PCName. And about the goddess. In fact, I've been hearing stories about a great deal of strange happenings in my city. I sent you to learn more about the attacks. I will assume that the rumors I have heard relate to that." "Greetings, %PCName. There is much still to be done for the people of Morrowind, and I believe we will both be needed. How may I help you?" "The goddess lives in her Temple here in Mournhold. She surrounds herself with her priest and guards, and rarely ventures from her chapel anymore." "It is an amazing story you have told about the goddess, %PCName. I commend your efforts." Barenziah: "She is the Queen Mother of Mournhold, Our Royal Mother." "Yes...we have various sources throughout Vvardenfell that are paid well to provide us with information. Unfortunately, sometimes it proves to be incorrect. One of our informants had suggested that you could pose a threat to our monarchy. That cannot be allowed, as I'm sure you understand." "There are more interesting things to speak of." Dark Brotherhood: "They are usually a very effective group. Not always, though, I have recently learned." "My sources tell me that Hler is the leader of the Hands of Almalexia. This makes him a potentially dangerous man, or a valuable ally." "Apparently, Hler has been killed. An interesting development. It will have to be looked into." "That is correct. I have come to know you a bit, %PCName. I believe you can be of some use to me. But the plans I have will require someone of great strength or wit. Perhaps both. The time has come for you to prove this to me. You will return here tomorrow, and you will duel Karrod. If you are able to defeat him, we will discuss my plans for you." "You will meet him tomorrow. Report back here tomorrow and be prepared to face Karrod." [Dagger of Symmachus has been added to your inventory.] "I'm impressed, %PCName. None have ever defeated Karrod in battle, and I certainly didn't expect you to be the first. You continue to surprise me. You have proven your worth to me, as well as your loyalty. Take this as a token of my faith in our friendship. It was my father's ceremonial dagger, and I place it now in your possession. Do not disgrace his memory, %PCName. Now, let us discuss my plans for you." "There is no need to speak of this further." "Drin is Almalexia's Lord Archcanon. I distrust him, but he is directly under the goddess's protection." "I've heard the Lord Archcanon was killed. Funny. I would have thought his goddess would have protected him." Helseth: "I am King Hlaalu Helseth, ruler of all Morrowind." High Ordinators: "The goddess's henchmen. They consider themselves a sacred order, but they are nothing more than religious zealots and thugs." "I met him many years ago, a deaf and dumb child wandering the streets of Wayrest. The boy actually had the audacity to try and rob my stepsister, Elysana. I marveled at his courage, and took him into my employ. When a dog has been beaten, %PCName, it will lick the hand of one who feeds it even the most meager of scraps. Now he is my most loyal of servants, and one of my most deadly. I wish for you to fight my champion." "The finest fighter I have ever known, as you will soon learn." "I'm amazed you were able to defeat him. There may be the stuff of greatness in you, %PCName." King Llethan's death: "May his spirit rest among his ancestors. We did all that could be done for him, but in the end, he seemed to have lost his will to live. He was a great man, and we mourn his loss." "I believe that the only person who might shed more light on this situation is Almalexia herself. All indications are that these creatures must be the constructs of Sotha Sil, and only Almalexia is likely to have information about him. I wish for you to speak to her, learn what she knows about the creatures, and report to me. There is no reason for the goddess to suspect that you and I may be allied. Use this to your advantage. Do not approach me again until you have learned all that you can." "When you know more, come talk to me. For now, visit the "goddess."" [Royal Guard Boots has been added to your inventory. Royal Guard Cuirass has been added to your inventory. Royal Guard Left Gauntlet has been added to your inventory. Royal Guard Right Gauntlet has been added to your inventory. Royal Guard Greaves has been added to your inventory. Royal Guard Helm has been added to your inventory. Royal Guard Left Pauldron has been added to your inventory. Royal Guard Right Pauldron has been added to your inventory. ]"The attacks were Almalexia's doing? And now you say that both she and Sotha Sil lie dead in the Clockwork City? She murders Sotha Sil, and then tries to kill you as well. Astounding! I believe your tale, %PCName, but do not expect my people to be so accepting of it. You will find it is not so easy to kill these gods in the hearts and minds of their followers. It will take time, but this will be a new era for Morrowind, and I will lead them into it. You have done well, my friend. You have my gratitude." "I have heard your story, my friend. I will not forget what you have done." Nerevarine: "I know all about you and the prophecies. And I know the Temple's position on the matter. My policy is to avoid involving the government in Temple matters wherever possible." Queen Mother: "You know, of course, of Queen Barenziah. We returned to Mournhold together, after the unpleasantness in Wayrest. An amazing woman, our mother. Not one to be taken lightly. Not much happens in Mournhold that she is not aware of. She is a valuable asset to us." "All in good time. First you will prove yourself." "As I'm certain you know, Mournhold is one of the seats of power for the Tribunal. The goddess Almalexia resides here in her Temple, surrounded by her High Ordinators. I have no great love for Almalexia, her Ordinators, or the Tribunal of which she is a part. In light of recent events, I believe it is time to gather more information about them." "As I've said, they relate to the recent events in the city." "Some of my informants have learned of a possible assassination plot against our royal person. I would like more information on this. However, I do not want to compromise the safety of my guards or of my informant. I believe, however, you would be suitable for this matter." "Yes...I expected you would find out as much. Other sources of mine indicate the same thing, and that the attempt will be made tomorrow night. Our mother must be protected at all costs, but I do not wish to tip my hand to these assassins. Here is how we will protect Barenziah." "It would be unwise to station more guards outside her doors, as that would alert the killers to our knowledge. Better to catch them in the act. One of our royal guards could be involved in this attempt, so they will be kept occupied elsewhere. You will stay in the antechamber outside our mother's chambers tomorrow evening, and deal with these assassins when they arrive. Close the door behind you and hide behind the screens, so as not to alert them to your presence. Meantime, find out whatever else you can." "Wait in the antechamber outside Barenziah's room at nightfall and protect her from the assassins. You are to hide behind the screens in the anteroom, and make sure to close the door to the room behind you. We do not want to let the assassins know they are expected. In the meantime, find out whatever else you can about the attempt. Report to us when you have completed your task." [Helseth's Collar has been added to your inventory.] "You were able to hold off the assassins. Interesting. Perhaps the threat was not as great as it seemed. We commend you. Take this as a show of our appreciation. We are impressed with your efforts so far. When you are ready, speak to me about further service to your king." "It is good you were able to do your job." "I require all those close to me to be powerful, able to defend me from any adversary. Perhaps you have met my personal bodyguard, Karrod? He is a perfect example: the finest fighter I have met in all my travels, and loyal to me to the death." "The attack on Mournhold was as unexpected to me as it was destructive to the city. And I make it my business to remain forewarned of this sort of event. Many believed the attacking creatures to have been Dwemer constructs, but we know now that this is not the case. These creatures were beyond anything dreamt of by the Dwarves, creatures it would take the power of a god to create. I would like you to learn more about the attacks." "We've discussed this enough. You know what you must do." Royal Guard: "They are my personal guard, loyal only to me. I chose them myself, selecting only the most loyal and skilled warriors from all of Tamriel." "Does this surprise you? Even now, there are those that would see our head on a pike. What better way to achieve one's goals than to have others remove those that would oppose you? Surely you have some understanding of this? In fact, we have recently been told of a plot against the throne." "Some would wish it. They will live to regret it." "By your actions so far, you have proven yourself to be both strong and loyal to our throne. It is now time for you to prove yourself to me. Personally. I have plans for you, %PCName, and it is almost time they were put into motion." "Ah, yes. We were to discuss my plans for you. Let us do that." slight inconvenience: "We understand you were visited by some Dark Brotherhood assassins. A regrettable occurrence. They are a difficult lot, but they do have their usefulness. I'm certain that will no longer be a problem for you." some understanding: "I assume you've heard of the Morag Tong? And of the Dark Brotherhood? They have their purpose in Morrowind." "One of the Tribunal. None have seen the Tinkerer in centuries, from what I understand. I distrust these man-gods, especially ones I cannot find." "You have told me your story. The Tinkerer is no more." Talen Vandas: "A shame what happened to that man. He would have made an excellent advisor for me. Killed on a hunting trip. Tsk. He should have been more careful." "It is never easy for one to assume the throne, especially after the unfortunate set of circumstances that led to our beloved King Llethan's death. There are those who would seek to profit from such events, to take the opportunity to create unrest among the people. There are those, even, who would wish to see us dead." "Any threat will be dealt with quickly. And severely." "I wish for you to meet an informant of mine at a local cornerclub, The Winged Guar. You'll find it in Godsreach. He's an orc, and shouldn't be hard to pick out. Find him, and ask him about his "uncle's farm." He'll know what it means. Then report back to me with your information." "As I said, meet my informant at the Winged Guar. Ask him about his uncle's farm." "Tienius has been our friend and advisor for many years. I trust the man with my life." "Captain Delitian is dead. His murderer will be brought to justice. Soon." uncle's farm: "Just ask him about it." Because of his 100% Reflect, it is highly recommended not to use cast-on-strike weapons when fighting him. An alternative is to fully discharge the weapons before the fight. If you choose to kill Helseth during or after the Main Quest, you will only incur a 40 gold bounty. Most NPCs in Mournhold will mention his death if you ask them but will not seem to mind his passing too much. Like his mother, he will be one of the few people in-game to believe you if you tell him about the death of the Tribunal, but he will demand your silence on the matter for the sake of maintaining social and political stability. Taunting and killing Helseth after completing Helseth's Champion will have no detrimental effects on the rest of the Main Quest, other than losing out on the suit of Royal Guard Armor at the end of the game. However, as the name suggests, his guards wear it too, and with his ring, they likely won't be much trouble. Karrod is the only guard in the throne room that won't attack you if you kill Helseth after finishing the Main Quest. This page was last modified on 21 March 2019, at 16:34.